The public is invited to gather with Northwest students, employees and special guests for a program beginning at 2:30 p.m. Friday, Sept. 14, in Room 2550 of the Garrett-Strong Science Building. Pat Ward, the director of the Missouri Arboretum at Northwest, will lead the program. Robert Hendrickson, the founder of a group servicing 130 garden centers, and Steve Bailey, a plant and soil science expert, also are scheduled to speak. The celebration will culminate outside Garrett-Strong with a presentation by Jason Severe, a forester with the Missouri Department of Conservation, recognizing an Overcup Oak as a state champion tree and an American yellowwood as a state co-champion. Both are located between the B.D. Owens Library and Garrett-Strong and have been designated as champion trees by state measurements recorded this summer. The program, which coincides with the start of Northwest’s Family Weekend, will conclude with the planting of a golden rain tree. The Missouri State Legislature designated the Northwest campus as the Missouri Arboretum in 1993. Today, the campus is home to more than 1,700 trees and more than 160 species cultivated from throughout the world. Three trails – the Gaunt Trail, Tower Trail and Chataqua Trail – also traverse the campus to help visitors learn about the trees and get an up-close view of them. The idea of an arboretum on the Northwest campus started to grow during the 1980s after Dr. Johanne Wynne Fairchild, then an agriculture and biology instructor, had begun tagging the campus’ trees with the help of horticulture students. Eventually, she completed a listing of all of the campus’ trees and published the first in a series of “Tree Walk” pamphlets that included Northwest’s tree history as well as a listing of all tree species on the campus in 1992. Through Fairchild’s efforts, University administrators and Facility Services staff members worked to ensure legislation was created that designated the Northwest campus as the Missouri Arboretum. The legislation was sponsored by Missouri Congressman Sam Graves, who was then serving his first term as a state representative. The Northwest campus maintains a designation as a Tree Campus USA by the Arbor Day Foundation, and this summer it attained accreditation from the ArbNet Arboretum Accreditation Program and the Morton Arboretum as a Level II arboretum. It also has been named to a list of the “50 Most Amazing University Botanical Gardens and Arboretums in the U.S.” by BestCollegesOnline.org. 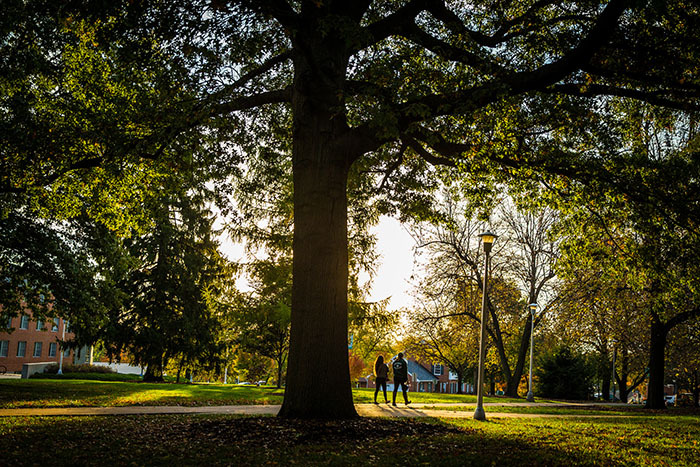 The University’s legacy of caring for trees and developing its lush landscape dates back to nearly 50 years before the institution’s founding in 1905. About 85 acres of the 330-acre campus were originally part of a tree farm and nursery established by Thomas Gaunt in 1857. To learn more about the Missouri Arboretum and the commemorative tree program, visit www.nwmissouri.edu/arboretum/.